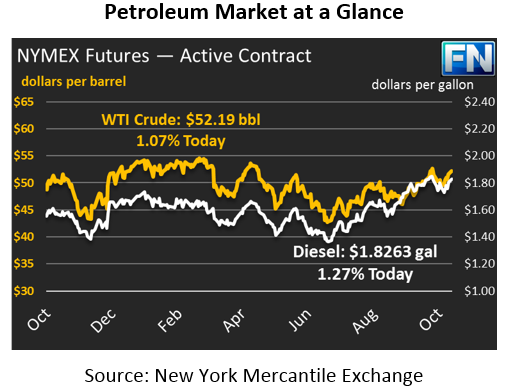 Oil markets are up significantly this morning, propelled by instability in the Middle East. After closing roughly 70 cents higher on Friday, crude prices have continued their gains today and are currently $52.19, a gain of 74 cents (1.4%). This is the highest prices have been since late September, when the Kurds in Northern Iraq voted for independence from Iraq. Coincidentally, it’s news from Iraq that’s driving the market higher again today. Refined products are also up today, following crude prices higher. Diesel prices are up 2.9 cents (1.6%) to $1.8263, while gasoline prices are currently $1.6395, a gain of 1.7 cents (1.1%). Diesel prices continue to be supported by strong demand and declining inventories; a cold winter could potentially drive diesel prices higher. Gasoline, on the other hand, remains weak. Demand has tapered down for the season, and absent a significant disruption, gasoline will likely trade lower for the final quarter of the year. Markets are focused on Iraq and Iran this morning. Iraqi military operations have begun to take back Kurdish controlled fields in Kirkuk, a northern territory in Iraq. No major players in the area, including the U.S., approve of the Kurd’s push for independence. The situation is quickly tilting towards escalation, which could jeopardize half a million barrels of crude production, causing price shocks. Iran is the other story of the day, with pointed language from the U.S. and Iran causing traders to be cautious of volatility. Trump is opposed to re-certifying Iran, pushing the issue to Congress. Congress has 60 days to take action before sanctions are re-imposed on Iran, which could take up to 2 million barrels per day off the market. The situation in Iraq and Iran are both creating risky scenarios that skew significantly towards the upside.